1 of 7 Heat oven to 450 degrees F. Place a large wire rack on a large baking sheet and coat with nonstick cooking spray. 2 of 7 In a small bowl, mix wasabi powder with 1 tablespoon water. Stir in sour cream, scallions, parsley and 1/4 teaspoon of the salt; refrigerate. 3 of 7 Place the carrots in a small saucepan of boiling water and cook 3 minutes until crisp tender. Drain and pat carrots dry. 4 of 7 Place egg whites in a shallow dish and add remaining 1/4 teaspoon of the salt. 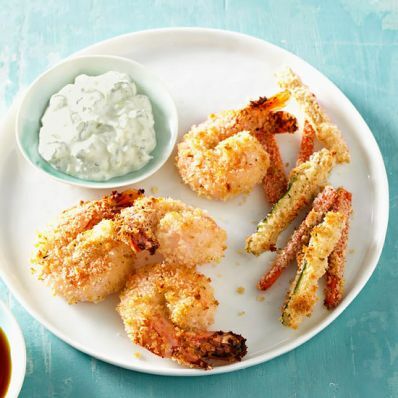 Spread the panko in a second dish. 5 of 7 Dip shrimp in egg, coat with panko and place on prepared pan. Repeat with carrot and zucchini. 6 of 7 Bake shrimp and vegetables at 450 degrees F for 12 to 15 minutes or until shrimp and vegetables are cooked through. Sprinkle vegetables with remaining 1/8 teaspoon salt. 7 of 7 Serve with wasabi sauce and, if desired, teriyaki sauce. Per Serving: 47 g pro., 498 kcal cal., 2 g fiber, 786 mg sodium, 290 mg chol., 11 g Fat, total, 5 g sat. fat, 51 g carb.